Meet Constance: a local real estate agent with spiky white hair, dark sunken eyes and an “exciting property” to show potential homeowners. She leads a group of visitors into a dark dining room with a cracked window, a bedroom with a chalk body outline and a bug-infested hallway, while rushing visitors past blood-spattered drapes, trash filled rooms and her ax-wielding brother, Walt. This haunted house scene turns out to be Constance’s reality as she tries to sell her family’s old abandoned property that has remained vacant for years. 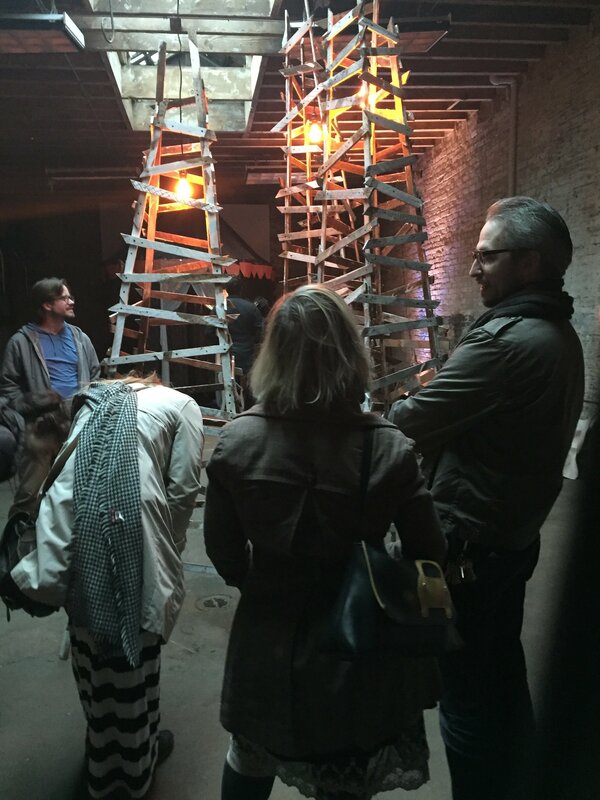 Amidst boarded up homes and vacant buildings, a warehouse-turned-arts-space hosted 250 people for this haunted house and immersive social commentary workshop in West Humboldt Park on Oct. 29 and 30. Writer Martha Bayne created A Memory Palace of Fear to challenge preconceptions about blighted neighborhoods and provoke conversation about housing issues. The interactive theater installation was produced by the artistic collective, Theater Oobleck, and partially funded by the Social Justice News Nexus. Bayne was an SJNN fellow during the recent fellowship cycle focused on housing, homelessness and segregation. For the fellowship, Bayne wrote an in-depth story for Crain’s Chicago Business about the innovative concept of using health care funding to pay for housing. A long-time reporter and editor who also works in theater, Bayne also wanted to explore the trauma many people experience around housing through a more creative and interactive medium. 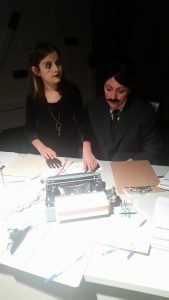 Building on a monologue she performed at the Rhinoceros Theater Festival in the spring, Bayne framed the haunted house as a symbol of social and economic injustices and struggles related to housing. 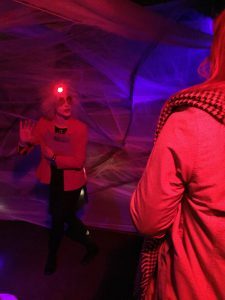 The workshop hosted at the arts community hub, Silent Funny, featured the haunted house tour led by an actor describing realities associated with abandoned properties in the neighborhood, such as infestations, lead poisoning, unemployment and foreclosures. Mention of the 2003 closure of the Brach’s Candy factory during the haunted house tour struck home with Sue and her sister Sandy Lenzen. Their mother worked at the West Side factory for about 15 years before it closed and the building was abandoned. The sisters are working to revitalize the neighborhood. “We are living this and need to know how to turn the neighborhood around,” Sandy Lenzen said. The haunted house tour culminated in meetings with a predatory loan officer and a housing fortune-teller. The wailing, masked fortune teller peered into a pool of blood to reveal a range of unusual housing fortunes, even casting some visitors to a fate living on Mars. Audio stories of housing ordeals — which helped inform the project — played from speakers as a loan officer did his work, asking potential homeowners to reveal highly invasive and personal information such as email passwords and bank account security codes. The fortune teller installation was done by local activist and artist Sara Heymann. 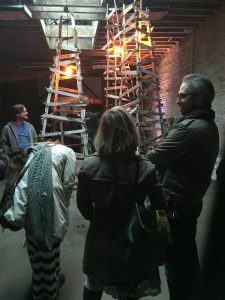 The audio piece was created by local musician Billie Jean Howard, and the haunted house build and art installation were assembled by artist and co-curator, Andrea Jablonski. 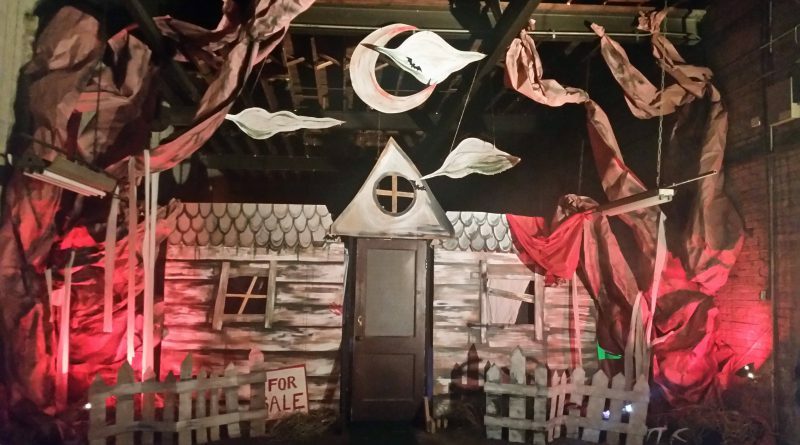 Bayne hopes to collect more stories and expand on this year’s workshopped performance with a more elaborate haunted house next year. By using real housing fears in the workshop, Bayne said she hoped to challenge perceptions about viewing abandoned properties as scary — because for many of the people she interviewed, dilapidated buildings and inadequate housing are daily realities but reflect deeper social issues. “They’re just angry and tired of fighting to make their neighborhoods better, a struggle that is ignored,” she said. Photo at top: Martha Bayne’s Haunted House in A Memory Palace of Fear. Photo by Kari Lydersen. Alexandria Johnson is excited to continue working at the Medill School of Journalism after graduating with both her Master’s and Bachelor’s degrees in June 2015.While in graduate school, Alexandria’s interest in social justice/investigative journalism grew. She worked on a short documentary about the challenges people with criminal records face when looking for jobs, and she was also a fellow for the Social Justice News Nexus. Follow Alexandria on Twitter at @alexandria1007.